My latest video project started out as a way to take advantage of an opportunity. Over the past few months I’ve had to travel to downtown Sacramento, CA every two weeks. Not knowing the city very well, I started arriving early to explore a bit, and found myself spending a lot of time down in Old Sacramento, the historic section on the Sacramento River that’s turned into a tourist trap destination. Since much of my photography and video projects have focused on the outdoors, I thought it would be good to challenge myself with a more travel-themed piece. It would also be a good way to test out the video chops of my recently-acquired Panasonic GH4. As I explored Old Sacramento in the early hours, the theme of the piece seemed to present itself: the quiet, empty streets and sidewalks were a marked contrast to the normal daytime and evening bustle of trinket shops and high-end eateries. 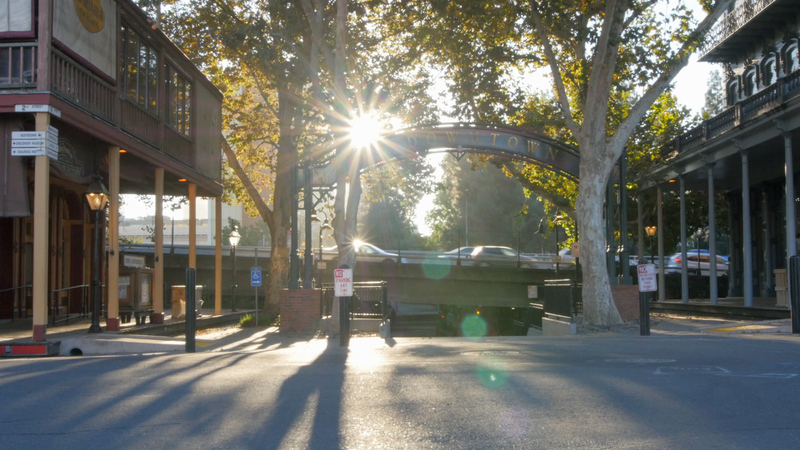 I wanted to show a different side of Old Sacramento: the quiet, waking hours. I wanted to show Old Sacramento waking up. I shot scenes for the video on several different days over the course of a couple months. I started showing up before sunrise, and then simply wandering the streets for an hour or so, looking for scenes and activities that might convey the general story I was after: low sun angles, people walking to work, setting up for the day, etc. Some of these shots I had in mind before I arrived, and sought them out; others I literally stumbled upon, frantically setting up before the moment passed. Sometimes successfully, sometimes not. I wanted to keep gear to a minimum for simplicity’s sake, and also to force myself to try and be creative. Probably 95% of the shots were done using either a Nikon 24mm f/2.8 or Nikon 50mm f/1.8 (with a Metabones SpeedBooster). Also, everything was shot locked off on a tripod, except for the last day of shooting where I broke down and brought a slider for a couple shots. Shooting everything in 4K on the GH4 allowed me to edit in full HD (1080p), but add a little movement to some shots during the editing process. While not a substitute for carefully planned camera moves, it was nice to have this flexibility. Planning is always one of the most important parts of the process, and stumbling around looking for shots rather than creating them (as you might in a more narrative piece), certainly has its limitations. Several shots I had pre-visualized I was able to find, but some of the ones I stumbled onto ended up being my favorites. While there are always things you can do differently, or ways to improve a project, I ultimately tried to heed the advice of Voltaire, who reminds us that “The perfect is the enemy of the good.” Sometimes you just have to hit the “Publish” button and move on. And ultimately I’m happy with how the video turned out. Sure, there were plenty of forehead-slaps over missed shots, different ideas that came to mind after I started editing, and other storylines that may have more interesting. But that just gives me something to look forward to next week. . . .